From left to right: Maggie Bates, Patrick Martin, Justus Peterson, Bobbi Plata and Shawn Serdahl. 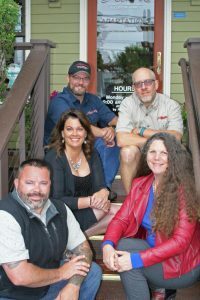 Photo courtesy: A-1 Builders Inc.
From left to right, top to bottom: Shawn Serdahl, Justus Peterson, Tom Dorr, Cindi Landreth, Maggie Bates, Bobbi Plata, Justus Peterson, Rick Dubrow and Patrick Martin. Photo courtesy: A-1 Builders Inc. The idea of selling A-1 Builders to their employees made a lot of sense to the pair. But although worker-owned cooperatives are becoming increasingly popular—due to their many benefits, including impressive productivity and high staff morale—the process of transitioning from a standard business to a worker-owned model is less common. Yet the forward-thinking duo thought the end result would be worth the effort. Their decision was solidified in 2010 when Dubrow and Landreth attended a U.S. Federation of Worker Cooperatives conference in Berkeley, CA. And so, after more than a decade of planning and deliberating, A-1 Builders officially became a Subchapter-T Corporation on July 1 operated by five initial owner-members: Patrick Martin (General Manager), Shawn Serdahl (Production Manager), Bobbi Plata (Office Manager), Maggie Bates (Design Manager) and Justus Peterson (Estimator and Project Management). These five have already logged 56 combined years with the company. And after the dust settles, the plan is to hopefully accept all qualifying employees as members of the cooperative. Every worthwhile project needs a great team and A-1 Builders has just that. Photo courtesy: A-1 Builders Inc.
Every worthwhile project needs a great team to make it happen, so the crew took advantage of local seminars and workshops on the co-op structure through Sustainable Connections and the Community Food Co-op and sought out local experts to assist in a variety of areas. Tom Dorr, of Dorr and Associates Consulting, served as the primary business strategist and transition “quarterback,” while Eric Grimstead and CJ Seitz, of the Small Business Development Center (SBDC), a free and local resource, helped pinpoint the company’s key performance indicators. Attorney Mike Jacobson and CPA John Mackey were also key players, referred by another worker-owned cooperative, Bellingham Bay Builders. Rick Dubrow and Cindi Landreth wanted to put their company in the hands of those who knew it best. Photo courtesy: A-1 Builders Inc.
For those who have worked with A-1 Builders, taking on this rather unexplored territory and giving such attention to detail is not surprising. 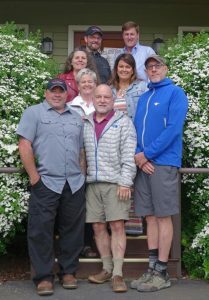 In addition to this cooperative, the Dubrow/Landreth duo leave an impressive trail of new local organizations they helped create during their careers: Sustainable Connections, Pro-Whatcom, Futurewise Whatcom, Transition Whatcom, Coal-Free Bellingham, Whatcom Folk School. Like these other organizations they birthed, their company has always been driven by what Dubrow refers to as triple bottom line management: considering people, planet and profit. Shouldn’t the people who helped grow the company be the ones who then take it to the next level? Who is better able to operate this company than those who’ve already done so?” Dubrow says. And the definition of “people” for the company extends beyond the staff. Customer care is the highest priority at A-1 Builders. Employees are continuously building positive relationships with their customers and the community. A-1 Builders’ successful transition will pave the way for others to follow with this innovative succession model. Photo courtesy: A-1 Builders Inc. Conversions of this sort may be rare but A-1 Builders’ successful transition has paved the way for others, laying down the groundwork for other businesses and organizations to follow as a viable, sustainable option in retirement and succession planning.